I've mentioned in comments before that I find Final Fantasy Tactics to be nearly the perfect game. There are many reasons for this: From the timeless graphics which hold up to this day, to the complex story, to the in-depth battle system which allows disgustingly precise amounts of customization for each of your characters. It is not exaggeration to say that this is literally a game I have played through at least twenty-four times to date. And to be honest, I'm perfectly happy knowing that before I die I'll probably play through it another thirty. And no matter how much I might say I like the story, the truth of the matter is that it's the gameplay which does it for me. For those of you who are unaware, Final Fantasy Tactics is a strategy-RPG like Shining Force II, Disgaea, Tactics Ogre, Vandal Hearts, Fire Emblem, Kartia, or Hoshigami. The player directs a team of four to five units across a gridded map, with the AI directing as much as eleven units against you. Typically there are only two objectives in a fight: Kill everything, kill a specific unit, or do one or the other while making sure the AI doesn't kill a unit on your side first. Bonus missions in the Deep Dungeon aside, the only exception is one stage, where you have to kill two units and then press the switches at their feet. To be honest, Final Fantasy Tactics suffers regarding objective variety when compared to some. The devil here, however, is in the details. Final Fantasy Tactics has a job system very similar to the one seen in Final Fantasy V, but Tactics takes one look at that and says "Yeah, you didn't go far enough." A character has a primary job, which affects multipliers given to their basic attributes (like Physical Attack, Magic Attack, HP, MP, etc.) and also grants them a list of job-specific abilities like spells, special attacks, and the like. You can choose to have the commands of a second job as well, so you can have Knights with White Magic, White Mages with Black Magic, or any other combination you can think of. Given that the game has twenty job classes, this makes for quite the variety, even early on in the game. In as little as four or five battles, your core group of characters can be wildly different from one another. 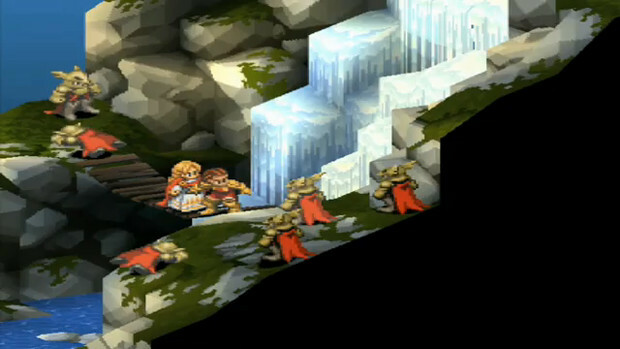 However, Final Fantasy Tactics doesn't feel the need to stop there. Every class also allows the character to learn Reaction abilities, which are triggered whenever the character is targeted in a specific manner. This can range from gaining Regeneration, to Auto-Life, to stopping the attack cold. This can be selected from any Reaction ability you know, regardless of your primary job or the secondary ability you have. Likewise a Support ability (which grant bonuses like extra Physical Attack power, dual-wielding, increased evasion, etc) can be selected from any ability you know independent of the others. Building on this, you also have a Movement ability. Increased vertical or horizontal range, the ability to find items or walk on hazardous or impassable terrain, and again ... independent from the other four choices. By the end of the game, you typically have a very different set of characters from your friend. Or anyone else, really. The farther from the beginning of the game you get, the more unique your playthrough becomes. Final Fantasy Tactics in two speech bubbles. However, this is not why I keep coming back. I probably would have moved on except for two factors. The first is that the Final Fantasy Tactics discussion board at GameFAQs formulated a couple of simple, yet thoroughly interesting playthrough challenges which reinvigorated the game for me. The first is the Straight Character Challenge. Essentially, you pick one of the 20 jobs available. For the entire duration of the game, you only fight using characters in that class. 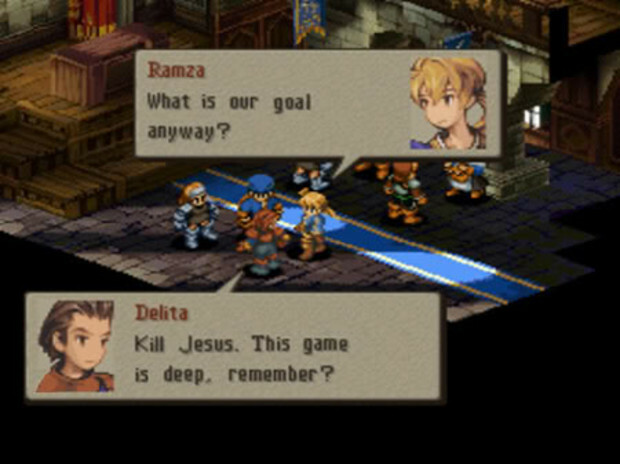 The main character, Ramza, plus four generic characters. Well-rounded classes with both healing and offensive abilities (like Chemist, White Mage, or Monk) are a little bit of a challenge, but nothing too difficult to manage. However it does up the difficulty and force you to approach your battles with far more caution. Other classes prove to be nightmares, running the razor's edge between victory and defeat. The Straight Character Challenge relies on the player using their superior intelligence to outwit the AI using a very limited skill set. I've beaten the game using a party of only one class fourteen times now, and I'm working on my fifteenth as I write this. Should this interest any owners of the game, it's recommended you start with Monk, Chemist, Priest, or Ninja, since they stand to suffer the least through such a challenge. Have fun with Weigraf the second time if you're a Chemist, though. If you're emulating, you can even take this farther... A party of all-Heaven Knights is a challenge in its own right. The other challenge is the Tactics Double Dare (Skip to [1.6]). Essentially this is the polar opposite of the above challenge. Instead of having a full party of characters using the same class, you only have two characters with two classes apiece, which you can switch and use abilities from freely, but otherwise must stick to. Much like the Straight Character Challenge, this one requires you to use your brains and change your strategies, but ultimately is also very rewarding to play. I've beaten the game nine times using this challenge. The other thing which will keep my interest in this game is the recently-released fan-made patch Final Fantasy Tactics v1.3. This is a complete, from the ground-up remake of the game. Every class has their abilities changed. Every in-game battle is filled with tougher enemies better equipped to ruin your day. Everything about the game is changed in a way which somehow manages to make things different and more difficult, but does so in a way that challenges a veteran player of Final Fantasy Tactics instead of alienating them. Lancers in my Zirekile Falls battle? It's more likely than you think. And that screenshot is really only the beginning. In his second appearance, Balk shows up with multiple Workers on his side, which by itself proves to be a monstrous challenge. 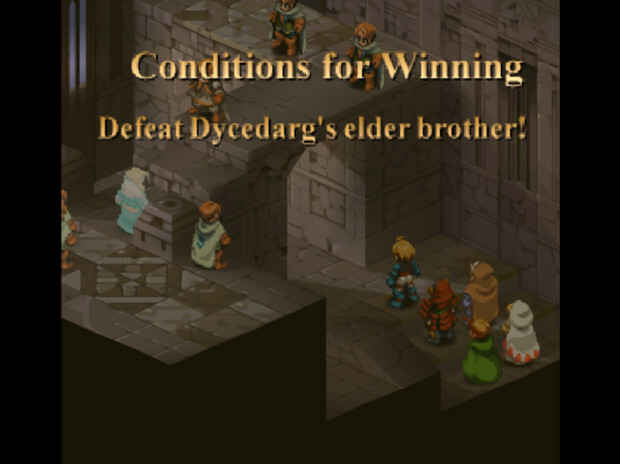 By itself, Final Fantasy Tactics v1.3 demands a playthrough just so that you can see for yourself how difficult the game would have been if the designers had been sadistic. And I'm planning on applying the challenges which kept the original game so fresh to my future playthroughs of it. I've begun with a Tactics Double Dare. It's almost more than I can handle already, and I'm gaming the system as much as possible. The idea of using only a single job class to get through this thing is giving me nightmares. 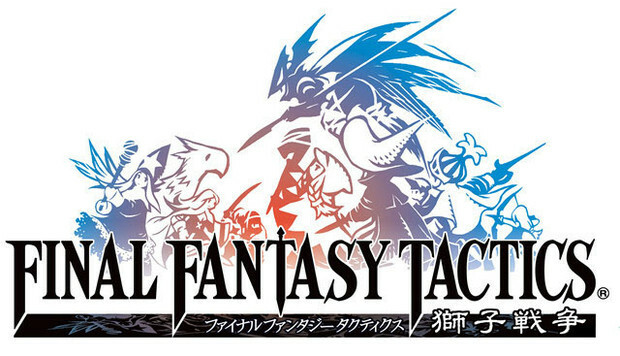 One of the reasons I feel Final Fantasy Tactics has maintained my interest is that, unlike other games with similar challenges in the Final Fantasy series, this one's gameplay (and thus, the area where the challenge applies) is such a large portion of the total time spent playing that you're not faced with hours upon hours of repetition. The cutscenes in the game are short, and hammering the O button will blitz through them very quickly if you've gotten bored with the story. However, storming Bethla Garrison with nothing but a crowd of Ninja is so completely different from doing so with a crowd of Knights that really, it could be a different game. Even without the patch, Final Fantasy Tactics possesses more replayability on one disc than some entire series have to offer, and I can give it no greater compliment than this: Of all the thousands of games I've played, of all the thousands I will play in the future, there is no doubt in my mind that Final Fantasy Tactics is my favourite of all time already. If I were forced to only play one game the rest of my life, I'd have this in hand before the question was finished.